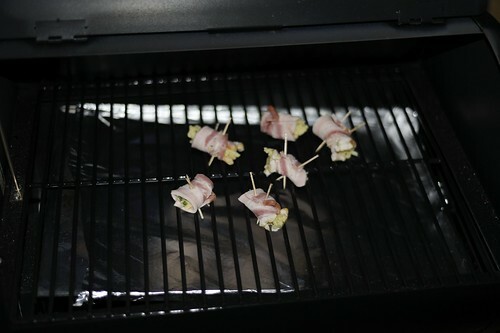 Combine the ingredients - shape them into rolls and wrap in bacon. I normally cut the rashes into three and use toothpicks to hold them. The below pics in the Traegar as a 1st off cook to see how they would come out - very nice! about the only thing I'm often missing there is the apple, guess they prob be ok without it, never seem to have any/many in house. I have to go and buy the Granny Smith Apple - certainly not a regular in my house - I think another style of apple would do. It does add to the overall taste. Yeah for sure, your dead right, I should make the effort. I'm defo gonna try this, how many does it make? 12 rashers n you cut in three , it's this 36? So - they are addictive when cooked - but granted 36 is a lot!!!!! I am not sure it makes 36 - maybe more like 24 - but still a lot. 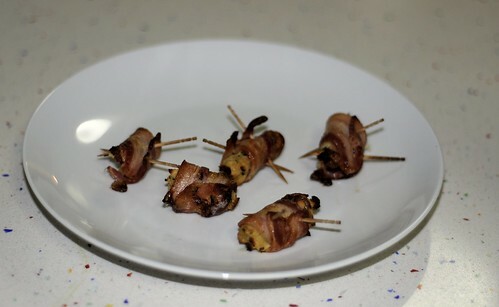 I recently made up the mix as per the recipe - and rolled out half of the mixture at the right diameter in six inch lots - froze in plastic wrap --> I then defrosted a month later / cut / wrapped in bacon and it was good. Ron173 wrote: Yeah for sure, your dead right, I should make the effort.